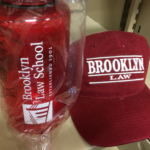 On September 25, 2018, as part of Brooklyn Law School’s “International Law Week” events, BLS librarians held an International Law Research open house at the library. 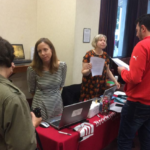 Over 60 students stopped by to learn about international legal research resources at BLS, including databases, research guides, and class-specific resources. They munched on Chocolates of the World, and entered the raffle: the lucky winners got to take home prizes that included Amazon gift cards, and BLS polo shirts, baseball caps, and water bottles. 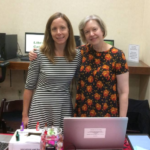 As usual, LeBron (Associate Librarian for International Law, Jean Davis) was a force on the court, preparing many detailed and helpful handouts, and teaching students all about the databases and tools they could use. Check out the resources she compiled on Human Rights in Myanmar here. Written by: Eric Yap on September 26, 2018. This entry was posted in BLS Students, Brooklyn Law School, International & Foreign Law and tagged Lebron on September 26, 2018 by Eric Yap.